Elements Applied: The rhizome and the herb itself in the period of blossoming are applied in medicine. Used for: The remedy is applied to stimulate the nervous system, heal the wounds, and prevent bleeding. Applied as an astringent, bennet has gained popularity in treating diarrhea. It is additionally used for gargling in case of halitosis and gum bleeding. It works as an appetite inducer and helps the organism to recover after the disease. People of older age can apply bennet for inducing metabolism and promoting digestive functions. It is also beneficial for recurrent fevers and bronchial catarrh. Additional Info: Bennet belongs to perennials and can be found in green forests, especially in shadowy places, along the walls, fences, and hedges. The rhizome is 3 inches in length, pink-colored from the inside, and brownish outside. The branchy stem is red-colored in its lower part, and may reach up to 2 feet high. The leaves in the lower part are pinnate, with the upper leaves being trifid or ternate. 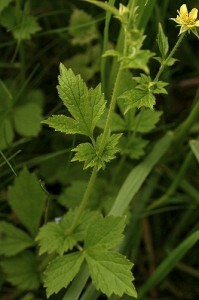 The leaflets are mostly serrate and ovate. The plant blossoms in summer period, producing star-formed flowers of yellow color. Preparation and Intake: To prepare a decoction, take 1 teaspoon of dry herb or root and fill it up with a cup of warm water. This should be drunk in a quantity of 1 cup per day. In form of tincture (commonly root tincture) the plant is applied in a quantity of 10 drops thrice a day. In form of powder half a teaspoon is applied thrice a day.